I took a friend's car for a brake fluid change here in Thailand recently. Good value at 300 Baht (£7.50). I was curious to know how often they recommended changing it and they said every 100,000 km. Maybe that's why the accident rate is so high here (among the many other contributing factors)? Also a few pics of some cars I haven't seen before for your collection. I liked this Toyota, what is it? 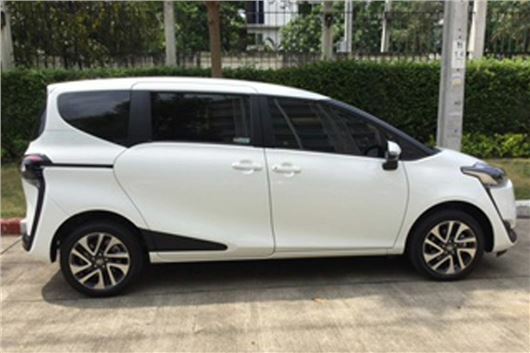 That's a Toyota Sienta, styled to look like a trekking shoe. 5 or 7 seats. Manual of CVT. Petrol or hybrid. There's a carbycar entry for it. It’s likely that the reason why brake fluid lasts longer is that it is hygroscopic and there is no cold weather condensation in Thailand. I want to replace my Audi A3 2.0TSi with a newer (not necessarily new) 5-door automatic petrol hatchback. My previous cars have included a Golf, a BMW, and a Lexus. Do you have any suggestions for a replacement that will give me good acceleration and comfortable ride? I have around £16,000 to spend. Mazda 3 2.0 6-speed auto, Honda Civic 1.8i-VTEC 5-speed auto. My husband is trying to buy a used petrol Jaguar XE with low mileage. Plenty of diesel cars are available but few petrol models. He has been offered a 2.0 Petrol R-Sport XE with 6,500 miles on the clock for £26,990. Is this a good buy and is there anything we should know about this model? If it's the 240PS Ford EcoBoost version, yes. Nice car. XEs with Jaguar’s own 200HP and 250HP Ingenium petrol engines are only just starting to come through. I have just returned from Havana where most of the cars are very old but there are quite a few brand new MGs, probably more than I have ever seen in the UK. Any idea why? As well as loads of 1950s US cars, there are quite a few ancient English Fords and Austins, and we even spotted a Vauxhall Viva. The new MGs are now all made by SAIC in China, another 'communist' country. A few months ago I received a notification by post from London indicating that a vehicle had entered the inner city without paying the Congestion Charge and that a fine was due to be paid. The notification was addressed to a person and concerned a car both of which are totally unknown to me, but used my postal address. I replied, indicating that my address was being used fraudulently and that the associated notification was nothing to do with me. Clearly, Transport for London took no notice of my response as, since then, I have received several increasingly threatening notifications informing me the matter has now been transferred to a debt collector and I can expect a visit from the bailiffs very soon. It seems that I am guilty until proven innocent and that the only way I can prove my innocence will be to present identification documents to the bailiffs when they arrive. I wonder how often this sort of situation arises and what the honest motorist can do to avoid it? If the car in question is not owned by you then there is nothing they can do. But if your car registration has been cloned you will have to prove that you and your car did not enter the Congestion Zone. I have been offered a 2001Y Skoda Fabia 1.4 Classic, and am considering buying it as a first car for my son. The car is one lady owner, with only 15k miles. The mileage is genuine, and can be confirmed, as I have known the owner since before she bought the car. It has been serviced every year by the Skoda dealer that supplied it new. Immaculate interior. New battery fitted today, car checked over by the AA patrolman who fitted the battery, and he approved of the car. The downside is plenty of scratches on the doors and bonnet and a dent in rear corner by rear lights. What worries me most is that the engine management light is on permanently, and has been on for several years. The supplying dealer has managed to switch it off, but it comes back on again after a few miles. The dealer says that the car is not driven enough (I agree) and that the light "should" go off after a good long run. However, I'm not so sure about this. I drove the car today, and it drives like new. Sweet engine, tight gearbox, no rattles or rumbles. As I was driving it a light labelled ‘EPC’ came up on the dashboard, and stayed there. I'm tempted to buy the car. It must be the lowest mileage Fabia of that age in the country (and I am aware of the fact that little use of a car is not a good thing). However, what about the lights on the dashboard? What do I need to do to switch them off? And how much should I offer her, should I decide to buy it? I don't want to insult a friend, but neither do I want to buy a money pit. We have an Audi A4 petrol automatic, 14 years old, but it has recently passed its MoT and we intend to give to our daughter in March when she returns to the UK after working in the USA for some years. We also have a three-year old Honda CR-V Executive Automatic, also petrol engine. When the Audi goes we shall be left with the Honda, which has been a very useful workhorse, but which we now find too large for our needs, particularly as we do mostly city driving and relatively short trips from home. The difficulty is that for a number of reasons we need a car with high driving/passenger seats where there is better visibility and ease of entry and exit. For this reason we are looking at small SUVs. We had a test drive in the Audi Q3, which was good to drive, but the internal space seemed small when compared with the Audi A4, though no doubt we would adjust to this. So what we are looking for is a small SUV petrol automatic and so far we are having difficulty with this since the dealers seem mostly to have showrooms stocked with diesels. We should be grateful for any advice or recommendations you may have. Honda HR-V 1.5iVTEC CVT-7, Suzuki Vitara S 1.4 Boosterjet auto, Peugeot 2008 1.2 Puretech 110 EAT6 auto, KIA Niro hybrid auto. Very sadly, my 2002 CLK 500 is coming to a natural decline. And since we are planning to spend a considerable amount of time around the Mediterranean in Spain or France over the next few years we want to buy a cabriolet. We have up to £22,000 and are looking at Mercedes E-Class, Audi A5, or BMW 3 or 6 series. Petrol automatic and RHD, or would it be cheaper to get a LHD bought in Europe? I think your column has said the Audi uses oil, so which would you recommend or any other alternative please. Get a Lexus IS250C. Like the BMW 3-Seriesd, it has an electric folding hard-top for security and it is particularly quiet with minimal buffeting with the top down. These days, LHD is actually more expensive in Europe than RHD is in the UK. We are well into our 60s but drive about 15k miles a year, often on long continental road trips. We are looking to trade in my lovely but thirsty Octavia vRS and get a smaller, more frugal replacement. We would like it to have a bit of oomph, yet be relatively economical. Not too low in the seats for my missus (hip replacement), comfortable for the long trips and preferably able to go in my garage (so no wider than the vRS, which does, just). Is this possible? Our 2004 Skoda Octavia 2.0 TDI 140 hatchback has 186,888 miles as I write. We bought it in February 2007 and it’s done an annual average of 13,928 miles since then. The car has been thoroughly reliable and economical but is getting to the stage when we must consider replacing it. It’s our only vehicle and, apart from daily domestic use, we use it to tow a two-berth caravan that has an MPTLM of 1,239kg, so we’ll need something that weighs no less than our Octavia and that offers at least the same horsepower. It can’t be longer than the Octavia, except by a few inches, or it won’t fit in our garage. We won’t be buying brand new, because we can’t afford it. We also need a reliable, family sized car, as we have two young grandchildren to ferry around from time to time. The Skoda dealer where we bought our Octavia is shortly to have a sales promotion event, with the usual discounts, etc., including on used cars. So we’ll go along and see what’s on offer. If nothing else had to be considered, we’d almost certainly go for a more up to date version of the car we have. However, the current controversy over diesel emissions makes us wonder if it would be more sensible to go for a turbo petrol car instead, even though we might not get the same torque. We’d be very grateful for any advice you might be able to offer on this, i.e. petrol or diesel, Skoda or other make, and what models? As you have probably guessed, we don’t change our car frequently enough to have gathered much experience in this area. An Octavia or Yeti 1.4TSI 150 should be up to the job without diesel filter problems. Both should be discounted because the Octavia is about to get a facelift and the Yeti will be replaced by a new model later this year. A permanently narrow garage means any replacement for my 11-year old Subaru Impreza WRX can’t be wider than 1,650mm. The only 4-wheel drive option I can find is a Suzuki Jimny but it’s so slow that it’d be quicker to walk. I say that I could get it tuned up to give a more respectable 0-60 acceleration of say 9 secs. My husband retorts that its drive train and brakes wouldn’t be up to the extra power and it would invalidate the manufacturer’s warranty as well as severely up my insurance. Any ideas? Best I can think of ids the new Peugeot 108GT 1.2 Puretech 130 6-speed at 1,615mm mirrors folded. Seems that the Suzuki Ignis 1.2 Dualjet 4WD is 1,690mm wide. I bought a Skoda Octavia L&K TDI Auto, new, in 2006. It has been brilliant, but I am starting to think about its petrol equivalent (SEL Auto) as we now only do about 10k a year. However, I gather the petrol engine option is only 1.4. This hardly seems adequate for a vehicle of that weight. I don't want to find I can't pass anything due to lack of "oomph." I appreciate I have probably been spoilt with the TDI's terrific torque, but I don't want to finish up with something underpowered. Ideally I'd like the 2.0 litre engine but I don't think Skoda are too keen on customers cherry picking different power plants. Your advice and or comments would be much appreciated. The turbocharged 1.4TSI 150 works better in this car than non-turbo 2.0 litres used to. Even the 1.4 125 isn't bad. But, of course, there is a 2.0TSI vRS, with 230HP or 245HP. Having driven diesel cars for over 20 years but now retired, my annual mileage is reduced to around 7,500. I’m thinking that, with all the current bad publicity and possible future penalties for using diesel, to change my present car and go for a petrol engine. Please can you recommend a petrol model of similar size to my current Mercedes-Benz B180 CDI Sport Autotronic. I would like something with similar boot capacity and preferably, but not essentially, with automatic transmission. Lastly, should I be considering leasing as an option? I like the VW Golf SV 1.4 TSI 125 and 150 very much. The downside is that the auto is a 7-speed dry clutch DSG that has been problematic. VW is gradually switching to a new 1.5TSI 120 and 150 with a 7-speed wet clutch DSG that is much better, but I can't tell you when the SV will get these: /road-tests/volkswagen/volkswagen-golf-sv-2014-road-test/ Obviously if you lease for 3 years, the long-term life of the transmission will not be your concern. I have a 2014/64 Audi A3, with SD card based satnav that was a £400+ option. I bought it because it was fully integrated and there would be no wires trailing, the audio would be through the car speakers and the directions would also appear in the dashboard display. When I first test-drove the car, the salesman told me that 5 map updates were included. I contacted the dealer last summer to arrange for the first of those updates. It turns out that the salesman was ‘incorrect’. That deal was only on the upgraded TechPack. He’s now left and the dealer is saying it’s my word against his. They quoted me £280 for an update, a little more than the writer of your letter was asked for. They later offered me a deal of £200 for the first update and £280 for the four subsequent updates: a total of £1,320 for the updates that I was told would be free. If they’d told me about that when buying the car, I’d have paid for the TechPack instead. It would have been cheaper, had better software, included the updates, included a higher res screen, a HDD for music and a couple of other toys. Needless to say, instead I spent £35 on the TomTom app for my phone which includes live traffic and updates for three years, a grip to hold the phone in place in an air-vent and somehow I cope with the dangling cable. When it comes time to replace my A3, or my wife’s A1, we will probably be going to a different dealer and getting everything in writing. The A5 Sportback in S-line trim does look very nice. Yes. EVERYTHING in writing on the purchase contract. All to easy to blame a salesmen "who has now left the company", and you can't prove what the slimeball told you to clinch a sale. Nevertheless, a good dealer would bend over backwards to keep you as a customer and this dealer didn't so he doesn't deserve your patronage in the future. My wife has a tediously unreliable Volvo V50 2.0D SE, which is of October 2006 vintage and which she acquired in July 2013. It seems to be working its way through every piece of the engine management system and turbo installation, and with the latest intermittent "Service Required" warnings coming up two days after we have spent £155 on getting an Actuator replaced (something to do with a red hot valve in the guts of the turbo system), we're at the point of wondering if, in getting this latest issue looked at and repaired, we are just throwing good money after bad. The car is serviced and (too frequently) repaired by our local Volvo dealership, but I am wondering if you can recommend an independent Volvo specialist in the Thame, Oxford area that we could take the vehicle to for a thorough look at what might be going on, and to help us figure out if we should keep the faith, or cut and run from this particular car. A car that, I should add, for all the frustrations caused by the above, actually meets the need for a mid-sized estate car, that's nice and safe and is a bit of fun to drive. In theory, I suppose the people that should know how best to fix things ought to be Volvo, through their dealers, but I know you do often recommend independent specialists who I assume you have more faith in for one reason or another. I am finally in a position to purchase a new vehicle after 3-years suffering 'delay characteristics' in my 7-speed DSG Polo. I have test-driven a 2015 Audi Q3 S-line Plus 2.0TFSI S-tronic, Quattro. During the 20-minute drive all seemed fine but I don't want to jump out of the frying pan into the fire. I can't make head nor tail of whether this is a 6 or 7-speed, wet or dry clutch, and whether on this particular model the clutch is good/bad. This purchase will need to see me through the next 10-years or so and I'm nervous of making a 2nd, very expensive mistake. I should note that due to a balance disorder I do require the ride to be firm, so the 19-inch wheels with low-profile tyres suit me. This Q3 might have the old 6-speed wet clutch s-tronic or the new 7-speed wet clutch s-tronic. If it's the new 7-speed with wet clutch, it's very good, but you have to confirm that with the dealer. This relates to a dispute of a parking fine dated 20 October 2016 at 10.30am. I initially challenged this fine to Parking Eye in a letter dated 4 November 2016. Within this letter I enclosed the following evidence: Pictures of both of the parking meters at the Morrisons Southwark car park displaying clear evidence that neither of the meters were in use at the time when I entered the car park. My appeal was rejected for the reason that “no parking was purchased on the date of the parking event, despite there being payment methods available on the day in question.” As per the photographs there is absolutely no doubt that neither of the parking meters were in use at the time I attempted to pay for parking. Following this, I appealed via the online process to POPLA on the same grounds as above. This appeal was also rejected for the reason that: “the appellant's vehicle was not registered against a payment.” The rejection also stated that “the appellant attempted to make payment for the parking.” For the following reasons I will continue to contest this parking fine and request to have the fine cancelled on the following grounds: As per the above, the photographs clearly demonstrate that at the time I attempted to purchase a parking ticket, the machines were not in use; The security guard next to the meter stated that I do not need to pay as the machines were out of use, as long as I left within 2 hours (which I did and is evidenced clearly in the attached audio recording from the date and time I received the ticket); I can't be expected to wait by the meters for an indefinite amount of time until the meters are then fixed; There was a queue of people standing by the machine that also couldn't purchase a parking ticket on the basis that the machine had "swallowed" their money, suggesting that the machine may have been recording tickets being purchased, when none were in fact being printed out; There have been similar issues with these parking meters in the past and I attach a previous appeal dated 4 August 2016, which reflects almost identically with the situation on 20 October 2016. The appeal dated 4 August 2016 was successful as per Parking Eye's letter of 16 August 2016 included in the attachment. I think you have a very strong case to take to the County Court because it is totally unreasonable to penalise drivers for parking when the relevant parking ticket machine is not working and you have excellent evidence proving that this particular machine wasn't working. Parking Eye is using the Supreme Court ruling in Beavis v Parking Eye, November 2015, to enforce penalties on a totally different set of facts from Beavis. The Beavis case was about a simple overstay. Your case is about deliberate entrapment by the parking enforcement companies when the means of paying for parking is not working. This whole issue will only ever be settled satisfactorily when a case on your facts goes all the way to the Supreme Court and the Supreme Court hopefully makes the right ruling on these facts. Crowdfunding has been suggested as a means of sponsoring this.